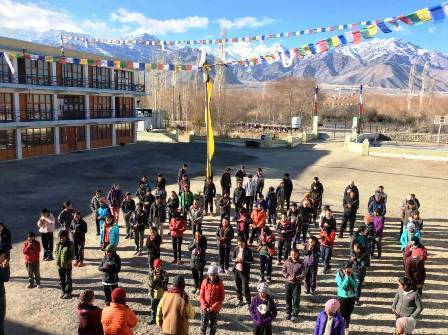 Leh, January 08 (Scoop News)-A two months winter coaching has been started at Lingshed Residential Hostel Choglamsar since Dec.22 jointly by Singelalok Yarchos Chenmo Committee, Lingshed Area Development Foundation Association and Lingshed Constituency councilor. More than 100 students from Lingshed area are attending this winter coaching. Councilor Lingshed said that the main objective of this winter coaching is to impart education to students about Buddhist Philosophy and teachings based on logic, reasoning, debate and practical implication, besides teaching them Bhoti grammar and modern day education. The resource person include from Buddhist Philosophy teachers from South India Gomang Dratsang Monastic University, from higher education teachers and 8 teachers having great interest in Himalayan studies in Ladakh all from Lingshed area.